Now that a family member has been diagnosed with Alzheimer's disease, it is essential for you to learn as much as you can about the disease. 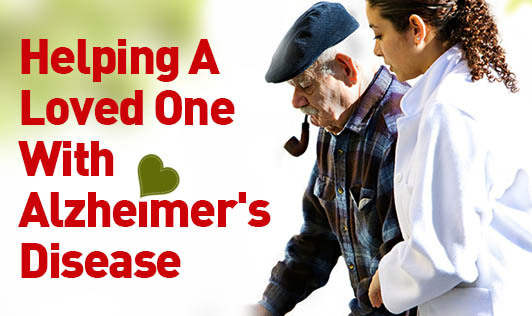 You may feel you don't know how to care for your loved one with Alzheimer's. Understanding the behaviour of a person with AD can help lessen any difficulties that you may face. • Severe anxiety about daily life which may be exhibited by asking questions and repeating information about one's familiar events or people, preparing for day care well ahead of time and using notes and reminders endlessly. • A lack of initiative about tasks that used to be a routine, though now feel devastating. • Persistent agitation may occur as the person with AD become less able to interpret their environment and control or express their feelings. 1. Set reasonable and attainable goals so that you don't end up exhausted and frustrated. 2. Foresee misinterpretation by your loved one. Your loved one with AD may no longer be able to precisely interpret verbal and non-verbal cues which can cause frustration and anxiety. Try to be concise in your communications by repeating yourself using the same words or message. 3. Keep in mind that all behaviour has a purpose. People with AD may display behavioural symptoms such as shouting or striking out, but remember that they are not intentional and the person is not doing it on purpose, instead, they're more likely to convey a message that he or she can no longer explain in words. 4. Be flexible because your loved one's symptoms will change over time. Hence, if strategies such as notes or reminders are no longer working, don't use them. 5. Enjoy the good times by encouraging familiar activities that will continue to be enjoyable for a person with AD. 6. Reminisce about the past by encouraging discussions about people and places that are familiar and evoke pleasant feelings for both you and your patient. 7. Modify the environment to limit your patient's exposure to potentially unsafe situations. This can allow them to continue to be independent and safe. 8. Supervision may become necessary for people with AD as they become more forgetful and their judgement decreases. It's best to assess each situation individually and gradually increase your loved one's level of supervision as needed. This will help your loved one to maintain as much independence and autonomy as possible in as safe a setting as possible. A successful intervention at one stage may become a disturbance and disaster at another. Hence, seek help, ask for advice and talk to your doctor about treatment approaches, both pharmacological and non-pharmacological!